Is anyone there? Late breaking news! Today my brother's house was featured in the NYT Home section and my three pillows were stylin' in the great photos by Ethan Pines. So Bruno thought it would be fun to give Uncle David something he made for the new house, too. He picked these unfired clay pieces. Bruno's teacher suggested the children return the clay to the earth eventually, so we're sending it to Los Angeles to melt into David's garden. While Bruno and I were busy cooking up this scheme, my husband was in the kitchen whipping up his very own version of Green Tea Ice Cream. Mix matcha with 2 Tablespoons of the milk to make a smooth paste. Add the remaining milk and the agave nectar and mix thoroughly. Add the vanilla and stir well. Add the cream and stir. Freeze in ice cream maker according to manufacturer's instructions. This is like the Fior di Latte of Green Tea Ice Cream, if you know what I mean. Now I really am gone. See you again when MDK 2 is released in September. I have a few designs in the book and a personal favorite project by Mrs. Lear I got to test knit to show. Have a lovely summer! My shawl's border is less ruffled than Terhi's. I think I botched the increase ratio at the color change. She says she "increased one stitch for every two stitches," so I k, k, kf&b. That's every three stitches, isn't it? I should have k, k, m1 or k, kf&b, right? Guess I'll have to make another one! Denise had the book on her kitchen counter one day while I was visiting and I turned down kombucha so I could be compos mentis as I paged through it. Since that day a few months ago, I've cooked and baked from it a few times each week (last night's Big Curry Noodle Pot pictured here). It's one of THOSE books. Maybe three or four others on your kitchen shelf get spattered and cracked at the spine like this one will. Here are my other favorites: Marcella Hazan's Essentials of Classic Italian Cooking, The Gourmet Magazine Cookbook edited by Ruth Reichl, Deborah Madison's The Savory Way, and City Cuisine by Mary Sue Milliken and Susan Feniger. It took me two years, but I finally decided what I wanted to do with this IKEA gull fabric I bought to make a housewarming gift for friends who moved to the Phila area a while ago. These took all of half an hour to press and stitch according to no particular pattern. Last day of third grade today! The real question is how did black yarn get into my technicolor stash? This is Erika Knight's deep v sweater from Classic Knits just started. I made one for my mom substituting Jo Sharp DK Tweed for the Debbie Bliss Cathay called for in the pattern and the sweater turned out to be my mom's favorite garment this winter. I found some Cathay at a deep discount to make one for myself and now I know why test knitters are paid more when they knit up dark yarns. They should be paid more to work with cotton/silk blends, too. How more squinty and cranky can I be? A whole world opened up for me the day a friend recommended Upton Tea Imports. I asked him, "Do they have Assam tea?" "Which estate?" he asked me back. My answer to that question, after lots of taste testing of their excellent samplers, ended up being Halmari. 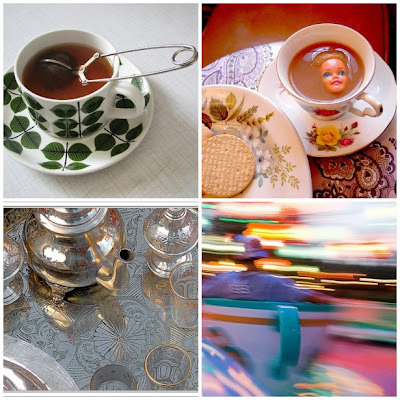 I've arranged a few photographers' images mosaic style from flickr that came up by searching tea. 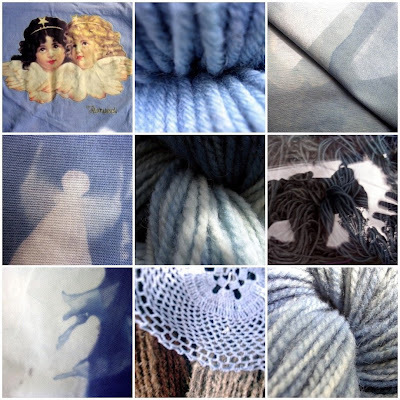 You are a Philadelphia-area crafter who makes things (or dyes, spins, otherwise produces yarn) for sale and you're interested in being at The Waldorf School of Philadelphia Holiday Fair in November. You will email me at cbshiffman (at) gmail (dot) com for more information and an application. I will email you back. Five balls of Felted Tweed on size 4s. All that garter stitch isn't quite so daunting when you're looking forward to this.